When a client requests beautiful 10” White Oak flooring for a New York City apartment, it gives us pause. Temperature and humidity fluctuations can cause havoc to wide floors, given the difficult microclimates in New York City buildings. Cupping, warping, or checking can happen. However, when proper construction methods are utilized and the floor is installed properly, very wide wood floors can succeed. The builder of this Flatiron apartment covered all the bases. They chose Virtu 3- layer White Oak, the most stable flooring construction available. Next, they installed a reliable HVAC system early in the construction schedule, particularly for the dry winter and humid summer conditions. When construction dust prevented the builder from using the HVAC system, they brought in temporary units to maintain a constant humidity to minimize floor and other woodwork movement. 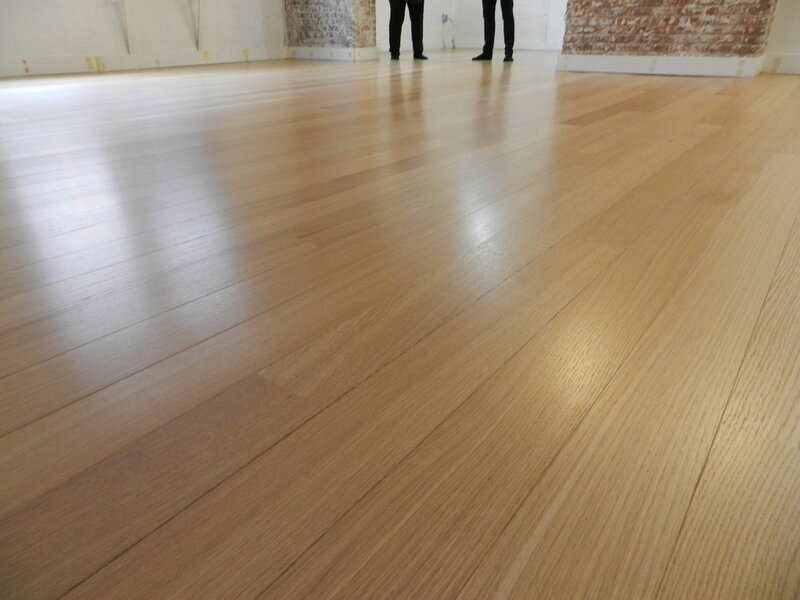 The result - an elegant floor that maintains its flatness and tight joints season after season. When it’s done right, you can have the finest wood floors without the problems. Some of our jobs can take 3 years between initial contact and job completion. And then, there are those that take three weeks, start to finish! A client in the Pacific Northwest requested a quote and a sample, placed a rush order for 3500' of 7” Virtu Special Rift, and flew 2 drivers to our manufacturing facility in Nyack, NY. They rented a truck, loaded up their Special Rift flooring and drove it across the country for a very special client. Total elapsed time from first contact to delivery: less than three weeks! A gut renovation of a pre-war building in the heart of downtown Brooklyn was designed to create modern, warm and inviting interiors for a couple growing into a family. With an expansive wall of windows, the interiors are flooded with natural daylight. The interior finishes and details were selected to create a refined aesthetic with modern, clean lines that emphasize an open plan. Large sliding doors, with textured vertical ribbing, made of white rift oak match Virtu’s rift sawn white oak flooring to create a seamless flow from floor to ceiling. 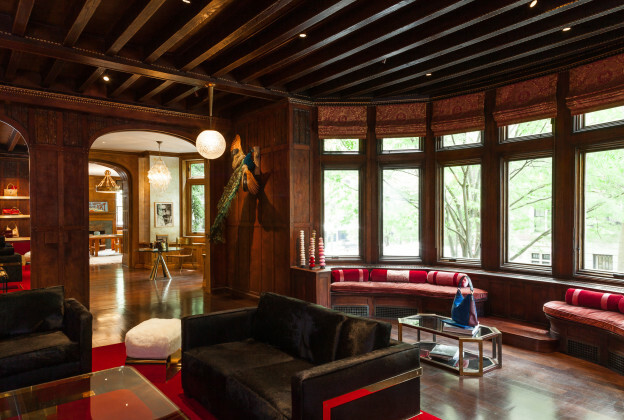 A gut renovation in a landmark status building. The owner chose 5" Special Rift Flooring with a natural finish to create a contemporary and sophisticated field of vision. Introducing Virtu Special Rift White Oak Flooring! We continue our quest to build flooring of extraordinary quality and beauty every day. Rift sawn white oak has been in our sights for some time. We can now announce that Virtu Wood Flooring manufactures rift sawn white oak flooring of unparalleled quality, with the uniformity of color and linearity of grain that is the essence of contemporary design. We are producing this exquisite flooring in widths from 5” up to 10" and lengths 4’ up to 10’. 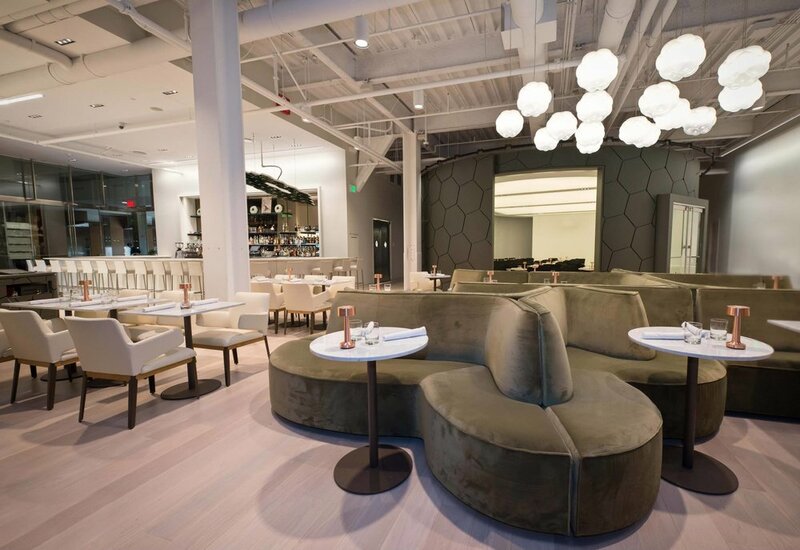 The floor can be supplied ready for finishing on-site, pre-finished in one of Virtu’s finishes, or custom finished to your specific requirement. The material can be FSC certified for LEED projects. This is the most impressive rift cut flooring we have ever seen. Everything in life should be this beautiful. If you want rift sawn white oak flooring, you want Virtu Special Rift. Someone recently handed me a piece of engineered flooring with a ¼” wear layer and a ½” plywood backer and asked me what I thought of it. The distributor was proud of this hefty wear layer, but what they really have is a floor with a greater potential of failure. The reasoning behind the “wood on plywood” design is that theoretically, the strength of the plywood will overcome the movement related stresses in the solid top layer. The thicker (and wider) the wear layer is, the more it performs like solid lumber, and the increased stresses generated by its movement are pitted against a thinner plywood backer. This movement can result in the forces of the wood overcoming the ability of the plywood core to suppress them, leading to checking, cupping, crowning, and in the worst cases, delamination. This photo shows delamination of the plywood. The force was enough to rip the plywood apart internally. This photo is from an apartment in New York City, this past winter. Virtu’s 3-layer “True Balanced Construction” (seen in the above photo) effectively creates a floor with plywood’s stability, and without the troubling element of an unbalanced top layer. Virtu utilizes the same species for the top and bottom, creating a balanced board, just like plywood. The top layer thickness in Virtu is engineered to provide a wear surface and useful life equal to a ¾” solid wood floor, with enhanced stability and reduced movement, and of course, unsurpassed beauty. THE TAKEAWAY: A wood layer adhered to plywood is already unbalanced. ‘Beefing it’ up makes it dangerous. Designed by Brandon Haw, Foster and Partners, the lobby for 551 west 21st is timeless and modern with a 34’ cathedral-like space. The beautiful natural light filters through, highlighting the impeccable details crafted with natural materials including Virtu 3 Layer 8” rift sawn white oak flooring. 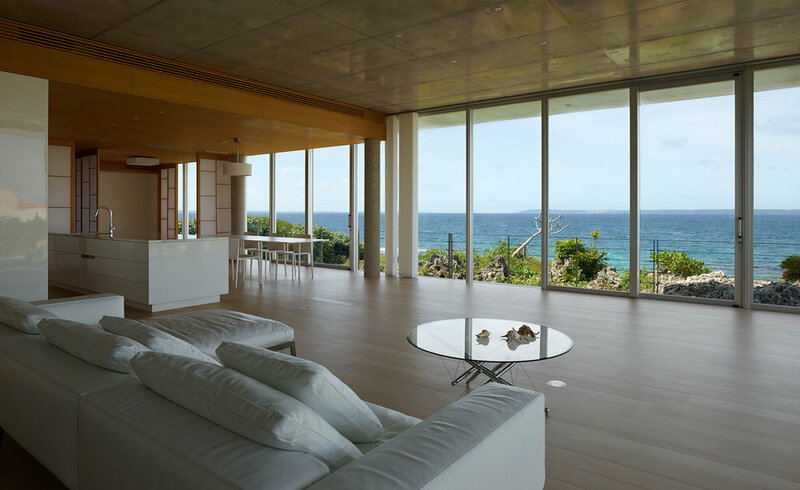 Perched on the edge of a cliff on this remote island and designed as a meditative retreat with expansive views of the East China Sea, the interiors blend contemporary and traditional Japanese elements. 6” rift sawn White Oak Flooring, custom finish. Hands down, one of THE most anticipated downtown building renovations of a former warehouse and book bindery. Each of these 53 luxury residential condominiums (200,000 sq ft building) in the Tribeca North Historical District has Virtu 6” and 8” rift and quartered white oak flooring adding their elegance as part of the finely crafted details in these generous and well-ordered residences. 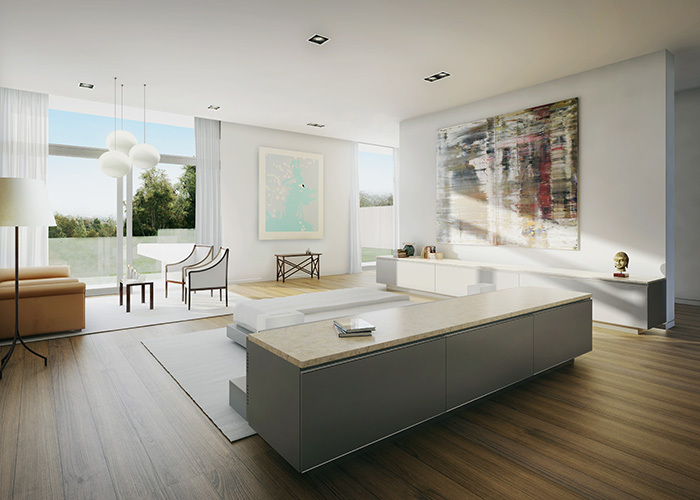 Imagine the sharp, clear light of the mid-day sun, glowing off Virtu’s wide plank white oak floors, illuminating the grand open-plan space in each home. Clear 10" plain sawn white oak flooring grace this open plan home with warmth and elegance in a verdant Beverly Hills setting. 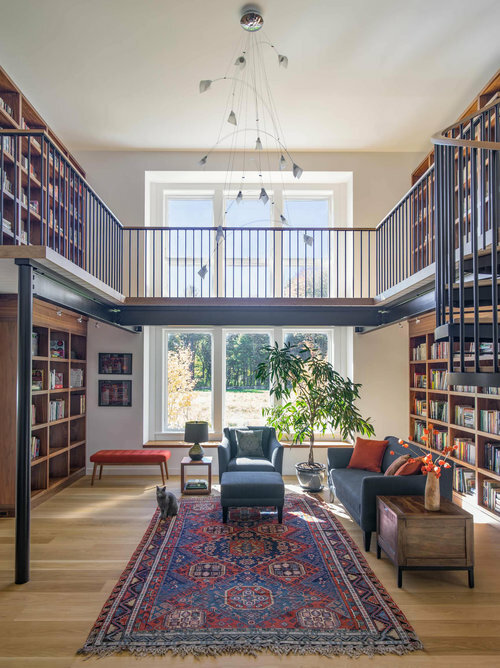 Clear 7" plain sawn Virtu 3 layer white oak flooring installed over radiant heat in this sophisticated, New England home. AVO transformed the Upstairs Kitchen to life by creating a modern space inspired by its roots. Leather walls and soft hides offer “an unexpected and opulent twist on traditional butcher shop tiles”. Virtu Flooring was paired with the leather wall treatments to add warmth and life to this functional space, once used for preparing game shot from the nearby balcony. Most people go to a museum to look at Art. Being a wood guy, it’s the floors that often draw my attention first – then the art, of course. That was definitely the case during my recent visit to the National Gallery in Washington, DC. John Russell Pope specified 150,000 ft.² of a 3-layer, balanced construction, quartered and rift white oak for this landmark building. This was the preferred method of building a wide plank floor in the first half of the 20th century, and it is the same construction that we use to make Virtu Flooring today. Here are those floors after 80 years - foot worn and showing the patina of age. Spectacular floors. 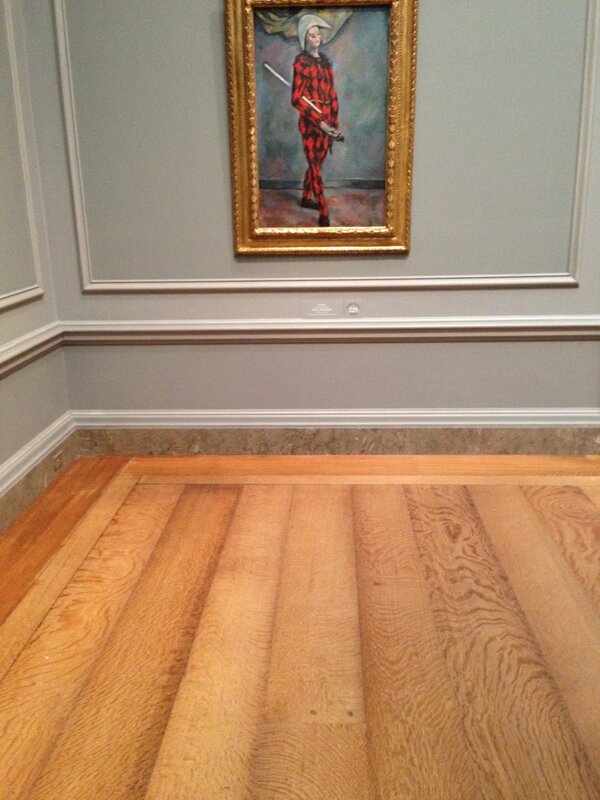 No wonder the guards asked me what I was doing looking down, instead of looking at the art on the walls. AA Studio, a global design firm, opened their new studio in Williamsburg in 2012. We recently returned to visit this highly respected team of international designers, planners and real estate entrepreneurs now comfortably settled in their Brooklyn studio which was designed as an adaptive use project from a former mechanical garage. 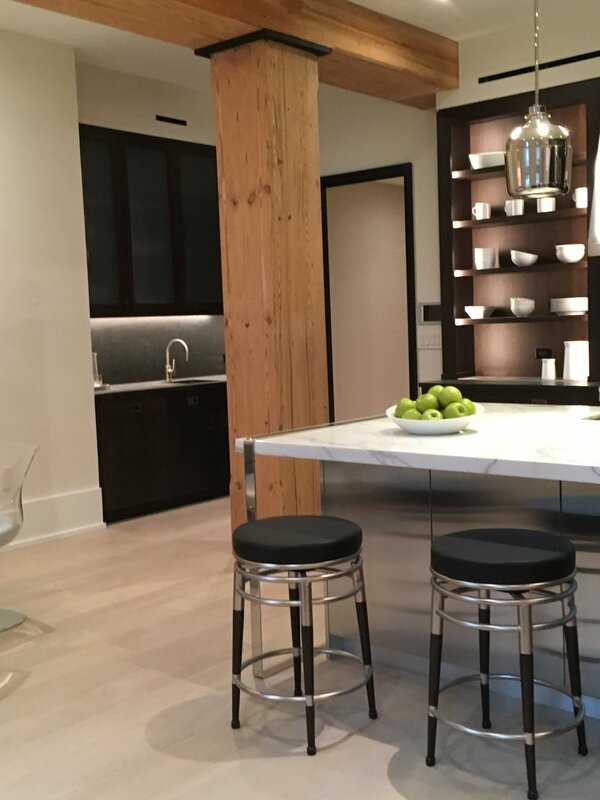 Entrenched and engaged as key participants in a host of projects, we were happy to see that Virtu’s 8”’ plain sawn white oak flooring was wearing well. We dare you to see if you can find where the water leak occurred last winter! Outstanding performance in the face of unforeseen problems is one of the reasons, Virtu Floors are THE choice for 3 layer beautiful wide plank floors. Virtu’s 6” rift and quartered white oak wide plank flooring was installed in a New York City apartment this past February. Unfortunately, a pipe broke in the residence above and water leaked through the ceiling onto the floor. 12 hours later, approximately 1” of standing water was found pooled on the Virtu floor. The water was mopped up and the concerned owner and flooring installer watched …. and waited. To their amazement, three days later, there was NO evidence of water saturation, delamination or cupping!!! The flooring installer who called us exclaimed, “This floor is amazing! We never expected the flooring to survive!” We were pleased, but not entirely surprised because that’s the way we build Virtu Floors – beautiful, stable and durable. Let us explain why. THE FLOOR -Virtu Flooring is constructed to be as stable as any floor can naturally be. Each of the three layers of our True-Balanced floors re-enforce the other two layers, enabling the floor to maintain flatness and stability in challenging conditions. THE GLUE - Our glue is a state-of-the-art, water-resistant adhesive with elastomeric properties that allows for some movement in response to the presence of moisture. The glue maintains a “memory’” and allows the wood to return to its original dimension once dry. Leaks and flooding occur more often than we would like, especially on a construction site. Fortunately, these homeowners chose the right flooring - Virtu. New York architect Ed Kopel’s gut renovation of a Brooklyn apartment is featured in this recent Dwell article and slide show. 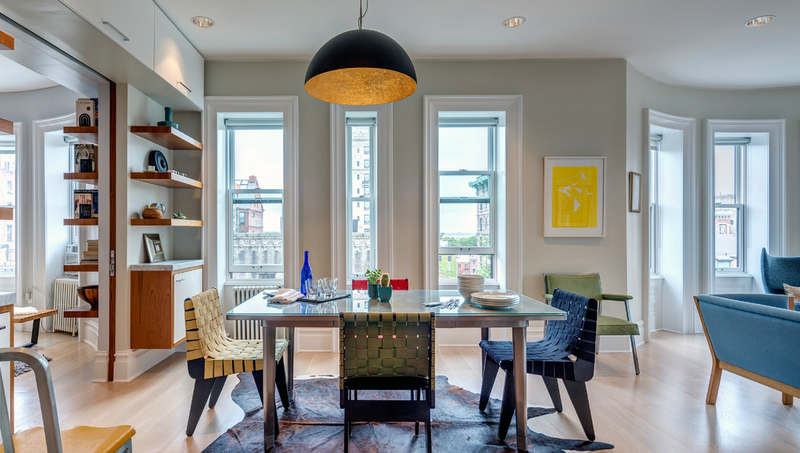 The apartment, located in the Brooklyn Heights Historic district, had not been renovated in over half a century. The architect was able to successfully create a new modernist interior that is colorful and comfortable for his client and family while maintaining the historical shell. Virtu oak flooring adds a light and natural uniformity in keeping with the architects intention and the clients’ wishes.